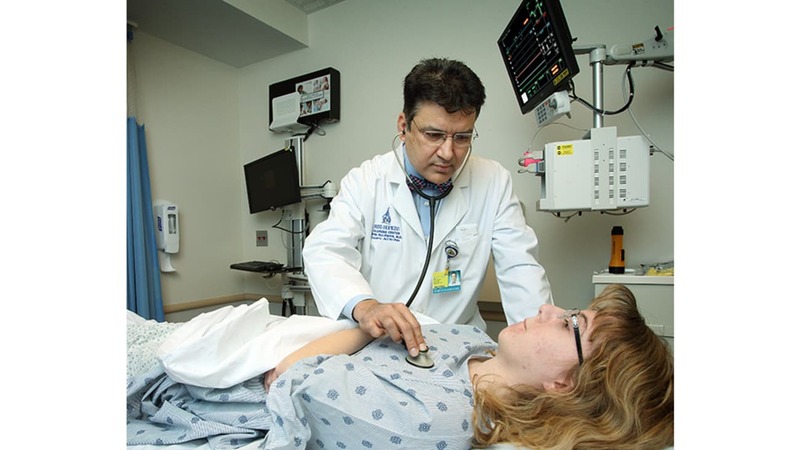 Pediatric anesthesiologist Irfan Suleman examines a patient. Pediatric chronic and interventional pain physician Irfan Suleman recalls treating an injured teen soccer player with a lumbar disc protrusion and excruciating pain in his right lower back radiating into his right leg and foot. Three weeks after administering an epidural steroid injection, his young patient reported that his pain had completely resolved and he was back to his normal routine. Similarly, Suleman administered a sacroiliac joint injection to a high school cheerleader experiencing episodes of chronic pain in her right hip. “In the follow-up, her pain was zero,” says Suleman. Noting that only a few children’s hospitals in the country offer such interventional pain services guided by imaging in the OR, Suleman says these cases illustrate a distinctive aspect of the pediatric pain management program at the Johns Hopkins Children’s Center, which he directs. Suleman notes, however, that the pediatric pain clinic takes a comprehensive, multidisciplinary approach in diagnosing and treating patients. The clinic includes a psychologist and physical therapist, along with Suleman, who meet with the patient and family as a team to arrive at the most effective treatment plan. That may include physical therapy to strengthen muscles, as well as cognitive behavior therapy (CBT) to change the way patients perceive their pain and the brain’s physiological response to pain. For pediatric patients with chronic pain, Suleman also refers patients to the intensive physical therapy and inpatient pain rehabilitation programs at the neighboring Kennedy Krieger Institute. For these patients, does the pain return at some point? “Because these conditions in pediatric patients are injury-related rather than age-related chronic inflammation, they do very well,” says Suleman, who focuses mostly on sports injuries. “But it’s a possibility when they reach 40 or 50, the pain might return. For more information, call 443-923-9440 or 844-334-3211 (toll free). Unraveling the mystery of pain is part of Irfan Suleman’s passion in treating pediatric patients. He recalls evaluating a teen who had constant abdominal pain since birth that multiple physicians, following an expensive diagnostic workup, could not effectively treat. Learning that the patient had undergone two surgeries at one week and four weeks after birth, Suleman examined the huge scar across his abdomen. So sensitive was the scar that the patient would not allow Suleman to touch it. Suspecting nerve entrapment in the scar, Suleman administered a diagnostic transversus abdominis plane block in the OR. “The patient and family were so excited because he had no pain for the first time in his life. He’s touching it, pulling and pushing it, and he doesn’t feel anything. His pain was gone completely,” says Suleman. Later, the patient was referred to a plastic surgeon for scar revision to resolve this issue completely.